I got this week's featured name from the list of Colonial names that I posted on Tuesday! It was apparently used back then but it sure is rare now! There are many "Rose" names out there. Beyond just Rose, there are Rosa, Rosalie, Rosamund, Roseanne, Roselyn, Rosemary, Rosetta, Rosemarie, etc. I have never been a huge fan of any of these. And then I found Primrose. 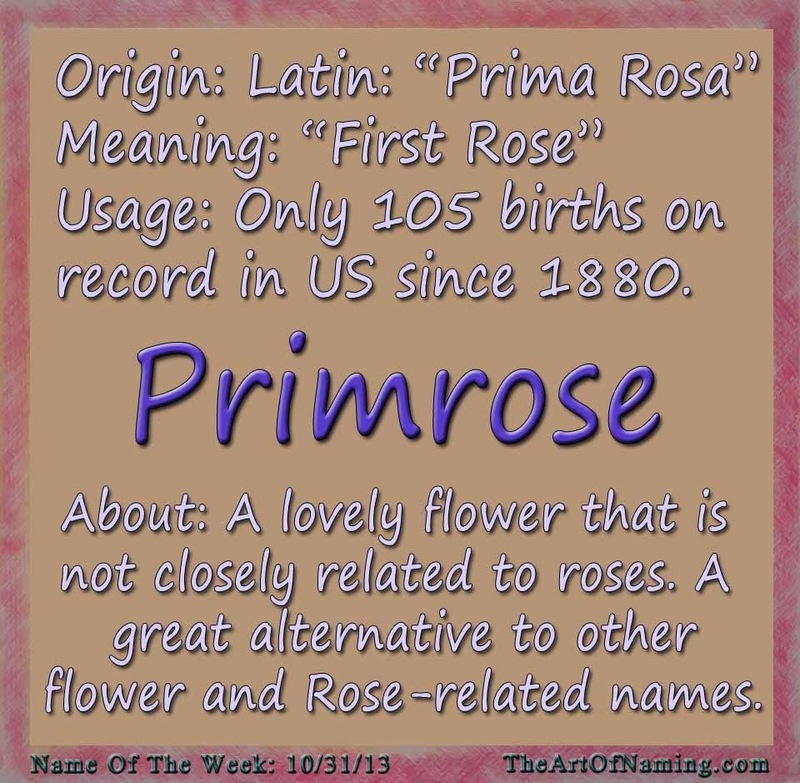 This name was originally used as a Scottish surname but it ultimately derives from the Latin "prima rosa" which means "first rose". And as its name indicates, it has the word "prim" in it which lends to the saying "prim and proper." Many people view this name as somewhat uppity but I think it is uniquely cool. 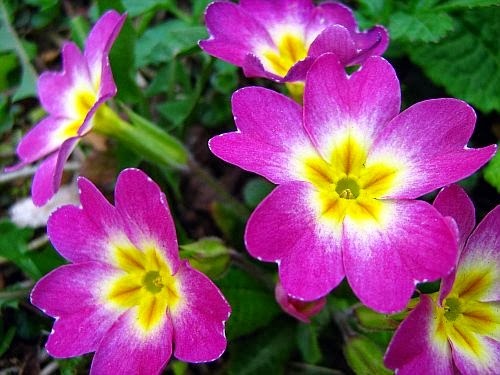 Primrose has been used in several British novels and TV series so it does have a British air about it that may not work as well in America. But despite the general vibe that it gives, it is definitely a bold and attractive choice! It is a great alternative to other popular flower names like Lily and Daisy and Rose itself! 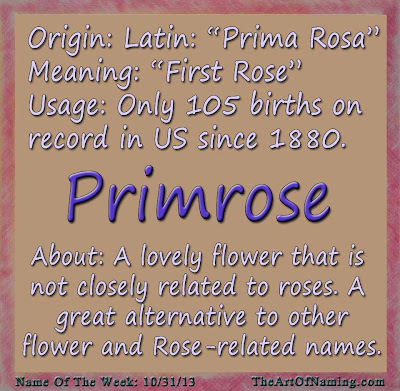 The most recent Primrose that may be familiar today is the character Primrose "Prim" Everdeen in the Hunger Games trilogy, who is of course the younger sister of Katniss. I think that it was that exact character that influenced the 16 births of girls named Primrose in 2012. Before 2012, there were no girls being given this name for 30 years! There were 5 born in 1982, 6 in 1973, 5 in 1960, 7 in 1940 and a total of 66 Primroses born between 1914 and 1932. Basically, this name is a rare gem! If you are looking for something pretty and unique, this is it! It has the beautiful image of flowers to back it up and she can still be called Rose or Rosie as a nickname. Win win! I would pair this name with something somewhat classic or traditional since it is a very unique choice. Something short and sweet! What do you think of this name? What would you pair with it? British Colonial America was a very important time in our history. They are the ones that started it all with a sense of freedom and independence. The ones who made the voyage over were discovering a whole new land and developing their own rules in their own new towns. They also had some interesting names, some of which you don't hear often today, and others that might just be cool enough to actually use again. These names were popular in colonial times, taken straight from the 18th century! Some of these overlap with the Biblical names list, and they seem to be much different than the names popular in England during the Victorian era. If you're looking for some cool, historical choices, perhaps you'll find a name that you like here! I noticed that there were a lot of Ab- and El- names. The list includes some biblical names that are common and even popular today like Elijah, Isaac, Josiah and Seth to name a few. Click here to view an updated report on the 10 Best Colonial Names for Boys and Girls! As for the girls, the list is a bit more limited. Again, there are some biblical names but also some virtue names that were popular with the puritans. Do you find any of these names completely unusable for a modern baby? Which is your favorite? Have you ever wondered which beginning letters seem to be most popular when it comes to baby names? I know that I tend to favor a certain few letters and then there are those letters that continuously stump me when searching for a favorite or even one that I can tolerate. 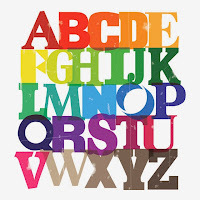 Have you ever tried to pick a single favorite name for each letter of the alphabet? I cannot narrow down my favorites for A or C or E, but when I get to the tail-end of the alphabet, choosing a decent one seems to be an impossible task! It begs the question, why do we prefer these letters and side-step those ones? Does it have to do with the sounds? I see trends that favor soft letters like vowels and L's and M's, (think names like Lila and Emma). Are there letters that just have really, really bad name choices all bunched up together? 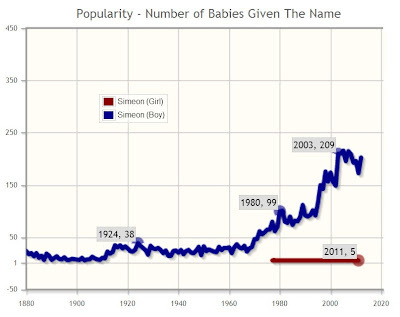 For instance, I was reminded of this article that discusses F names and how there is only ONE in the entire Top 100 in 2012 but there were 9 in 1880. Parents aren't naming their children Floyd and Fannie anymore. The article asked the question "Is F an unattractive sound for parents nowadays?" Tell me what you think. Is it related to the basic sound of the name, or does it have more to do with the names themselves? Below is a tally of how many names start with each letter in the US Top 100 for each gender. It is no surprise that the letters of the first half of the alphabet are dramatically more popular than the second half. J is definitely the most popular letter in the top 100 for boys. At first, I was a bit surprised at the amount of J names, but then it just seemed right after I thought more about it. So many of the timeless, biblical choices start with J, and many of those are in the top 100. 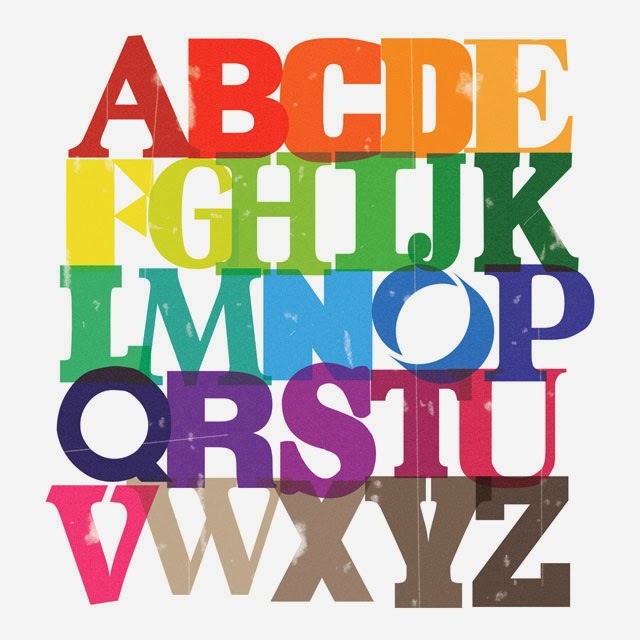 The next most popular letters are C with 12 names, then A with 11. After that, B and L both have 7.
Letters that are completely absent from the Top 100 for boys include F, Q, U, V,and Y. Additionally, P, X and Z only have one representative each. Not surprisingly, the letter A dominates feminine names. 22 of the names in the Top 100 start with A and 32 of them end with A, including the top 5! If you count names that end in the A-sound, like Hannah with the -ah, then you get a total of 37 names that end with the popular A-sound. In second place is the letter S with 11 names, and then M with 10. I was a bit surprised to see S be so popular since there were only 2 boys names in the top 100 that start with S. However, the favorite boy letter is J and the girls only have 3 of those on their side. Unpopular letters for the girls side include D, Q, U, W, X and Y all with 0 names. It is interesting to note which letters parents favor and how it differs for each gender. 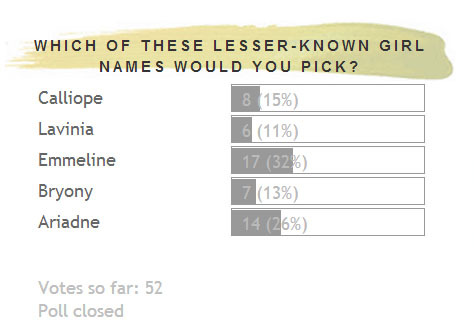 Just the letters A, S and M alone make up 43% of girl names. 42% of boys names begin with A, C and J.
I wanted to see this kind of data to see how my own naming preferences match up. 33% of America and I love A names. For a girl, A, C, E, and M tend to be my letters, whereas for the boys, I prefer A, D, E and M. My problem letters include B, F, J, K, N, P, S and T, besides the obviously tricky U and Y. It can sometimes feel a bit limiting. Which letters do you tend to favor and which do you have trouble with? 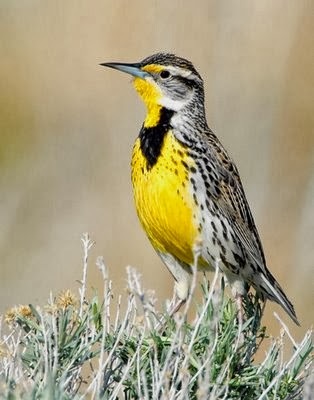 The Name of the Week is my favorite from the list of Bird-Inspired names. I took it from the Peregrine Falcon, but the meaning of Peregrine doesn't actually have anything to do with the bird. This is a name that is rarely used in the US because many have viewed it as an eccentric and extravagant name. However it has been considered elegant and even aristocratic in England. 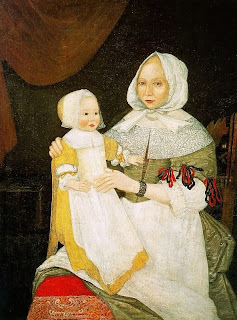 It was historically chosen as the name of the first English child born in America. The child, Peregrine White, was born on the Mayflower at what is known today as the Provincetown Harbor in Massachusetts. Interestingly, he had a brother named Resolved. Peregrine is also the name of several early saints, most notably Saint Peregrine Laziosi, the Patron Saint of Cancer Patients. 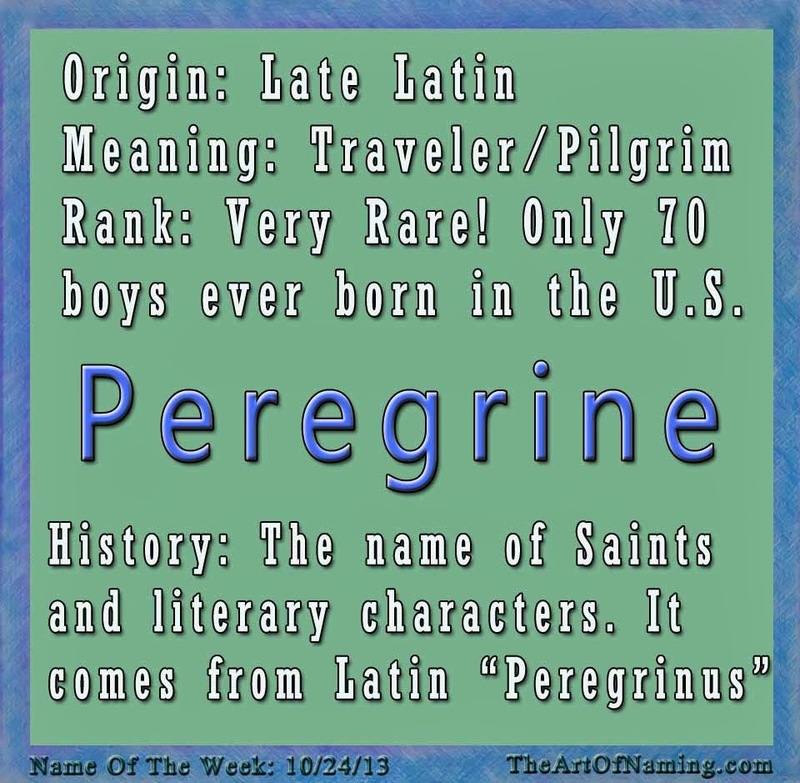 The name comes from the Late Latin name Peregrinus which means "traveler" and more recently "pilgrim". The Italian form of the name is Pellegrino which you may recognize as a brand of mineral water, San Pellegrino. There is also a character in a novel by Tobias Smollett called Peregrine Pickle. And you can't forget little Peregrin Took, a hobbit from "The Lord of the Rings" series, also known as Pippin. Pippin or Pip are darling nicknames for Peregrine, and there is also Perry. 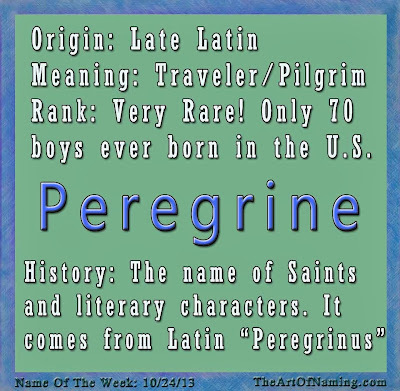 Clearly, Peregrine has history behind it from Saints to fictional characters to pilgrims. Statistically in the US, Peregrine has only been in use since 1998 with a total of 70 baby boys ever given the name, the most being in 2010 with 12 births. There have also been 12 girls given the name but it is solely considered a male name. I would pair a traditional or classic name with Peregrine to balance out the rarity. What would you pair with the name and what do you think of it? Let me know! P.S. 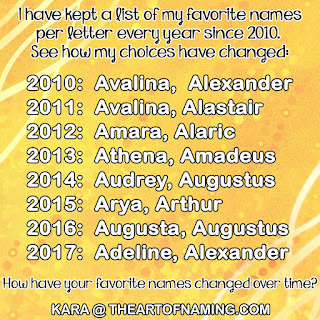 I have edited all of the previously featured names and added the above sibling and middle name categories for each of them! Take a look! Not Just For The Birds: 76 Bird-Inspired Baby Names! The following is a list of names that are inspired by birds! In some cases, the name may be a color name that describes the color of the bird like Scarlet and Tawny. In other cases, it is the name of the person who either discovered the bird or had the bird named after them like Tristram's Starling and Elliot's Pheasant. Of course there are the cool, common ones like Falcon and Wren. Take a look at the list and let me know which one of these you would consider using! Both male and female options are mixed together. Let's learn more about each of these names! Which is your favorite? Emmeline is a name that I fear is rising fast! 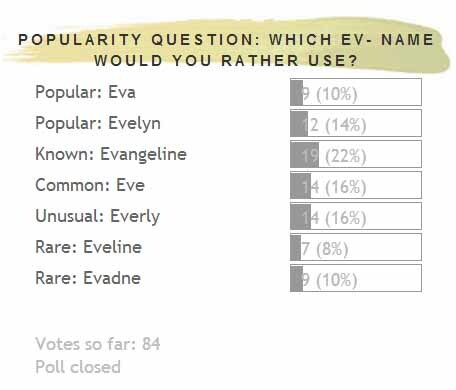 With the popularity of Emma and Emily, as well as -line names like Caroline and Madeline, Emmeline seems like a shoo-in! It is a French name that comes from German elements that mean "work." It ranked just outside of the US Top 1000 in 2012 at #1078. click here to read even more about this lovely choice. Ariadne is an Ancient Greek name that means "most holy." I first heard it in the move Inception (Ellen Page's character) and I liked it right away for being different but full of history. It is pronounced ar-ee-AD-nee. In Greek Mythology, she was the daughter of King Minos and eventually married the god Dionysus. This would be a cool alternative to the more-popular Aria and Ariana. It ranked #1762 in 2012. Calliope is pronounced cuh-LIE-oh-pee and is a Greek name that means "Beautiful Voice." In Greek Mythology, she was one of the 9 muses, the goddess of epic poetry and eloquence. To me, this name should be quite common since I hear it so often, but it has never ranked in the top 1000. Its gaining momentum but still only ranks at #1535 as of 2012. Read more about this name here. Bryony is another rare name! Pronounced BRIE-ə-nee, it ultimately comes from the Greek βρυω (bryo) meaning "to swell". It is the name of a Eurasian vine that was formerly used for medicinal purposes. I first heard this name (spelled Briony) from the movie "Atonement" and rather liked it. There were only 13 girls named Bryony in 2012. Its only been occasionally used in the US since 1976. Lavinia was the first name that I featured on the blog. It is of Roman/Latin origin with an unknown meaning. It ranked as high as #360 in 1880 and is quite an old-fashioned gem that many are unaware of. Lavinia was the mother of the Romans and the wife of the Trojan hero Aemeas who named Lavinium, Italy after her. The name hasn't been on the charts since 1929, but I hear it quite often. It was the name of a character on "Downton Abbey," which is where I first heard it. There were only 52 girls given this name in 2012! Read more about it here. The Girl Name of the Week is an African Name keeping in tradition of the past two blog posts. The name is Zola. First of all, this name is also a Literary Surname, taken by famous French-Italian writer Emile Zola (1840-1902). This form of Zola tends to be feminine despite being a surname originally. 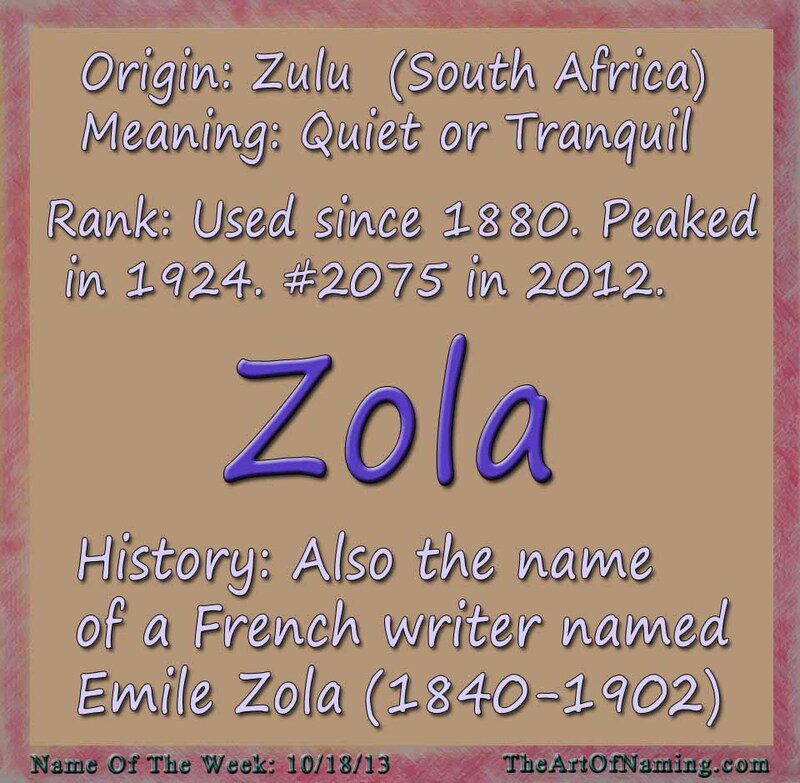 However, it is said that this form of Zola does not have a known meaning as it may have been invented as a surname. 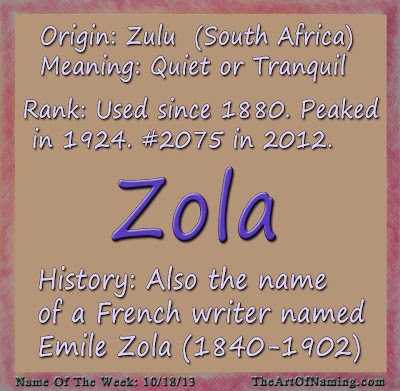 Emile Zola's father's surname was actually Zolla. Either way, it has been used occasionally in English-speaking countries since the 19th century. The version of the name that I'm featuring today is typically female when it is used as a first name, but it is sometimes used on African males as well. It is of Southern African or Zulu origin and it means "quiet or tranquil" in Zulu. The name is on record for having been used in the US since 1880. 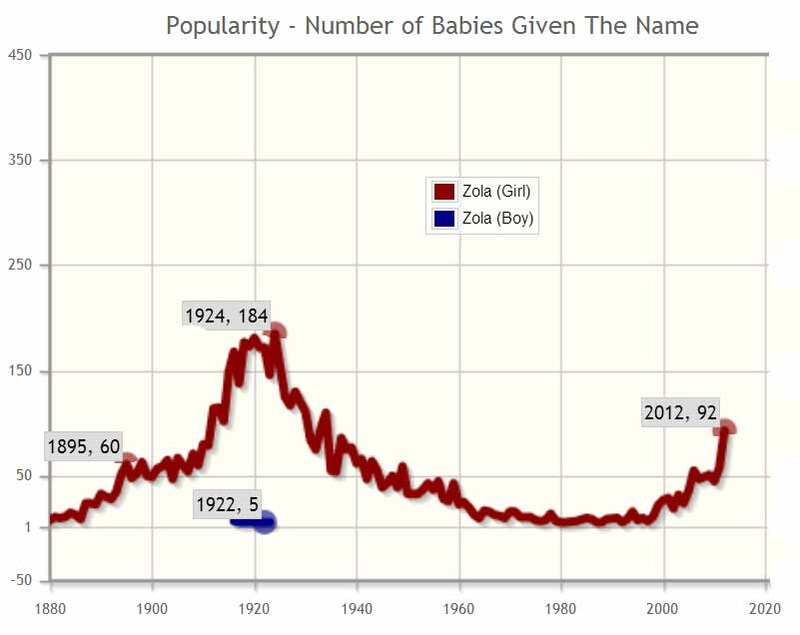 Zola's biggest year was 1924 when 184 baby girls were born. Usage declined after the 20's but it has always been in regular use. In 2012, there were 92 baby girls named Zola, ranking the name at #2075. 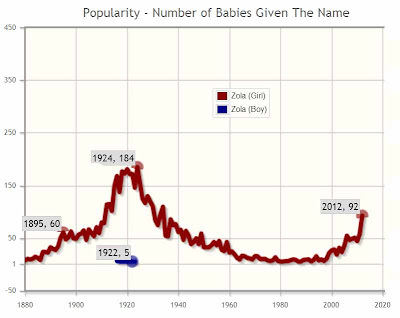 The name gained some popularity from 2011's 57 births, and the 44 Zola's born in 2010. It is impossible to know if parents who used the name Zola for a daughter were inspired by the writer or by the Zulu name, or possibly neither! I'd like to know how many of them were inspired by Zola, the adopted African daughter of Derek Shepherd and Meredith Grey on the TV show Grey's Anatomy. She first appeared on TV screens in May 2011, but saw more screen time in fall 2011/spring 2012. Perhaps she helped to boost the usage in 2012! Who knows! As for boys named Zola, there have only been 21 boys named Zola in recorded US history. 11 from 1916-1917, and 10 from 1922-1923. I do not have statistics for the number of boys who are given this name in Africa but I saw a few comments from different people saying that they know of men with this name. Click here for a list of famous people who either have the surname Zola, or their first name is Zola. Among them is Eddie Murphy and Nicole Mitchell's daughter named Zola Ivy Murphy. If I wanted to choose a traditionally African name to pair with Zola, I would use Zola Dumisani (which means "give praise" in Zulu) or Zola Mbali (which means "flower" in Zulu). What do you think of the name Zola? Would you ever use it? What would you pair with it? For the third installment of World-Wide Wednesday, we'll take a look at the naming traditions in Africa. For most Africans, baby-naming is extremely important. They place a high value on the name choice and its meaning. Many believe that it will have a major influence on the lives of the child and the family as a whole. There is a delicate balance between giving a child a name that is too ambitious and a simple name that may not yield high enough expectations. Of course, Africa is a very large continent and it is home to hundreds of different languages and customs. 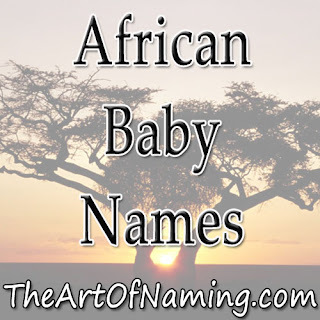 Traditionally, African parents like to give names that reflect the time and day of the birth, the environment in which the baby was born or other related circumstances like gender or birth order. Many African names also reflect the parents hopes, aspirations and dreams for the child, or they may have to do with their fears, their religious beliefs and their own philosophies about life and death. Sometimes these names can provide outsiders with an idea of the culture and events surrounding the time of their birth. Northern Africa sees a lot of Muslim names being used since many are Muslim. In Central and Southern Africa, there is a bit of European influence on names since many in that region are partially Christian and may speak French, English or Portuguese. In Nigeria, the meaning of names is so important that Nigerians will actually introduce themselves and then explain to people what their name means. Names are viewed as a promise, a vocation and a list of expectations for one's life. Their name IS their identity. Sometimes, the process of choosing a name is carefully decided upon by not only the parents, but also grandparents and extended family members. Naming a child is so important that it sometimes takes a whole village! When the child is finally born, there is an extensive naming ceremony, sometimes including prayers recited by a religious teacher and animal sacrifices. The reason for the ceremony is to formally give the child the selected names. Traditionally, the child will receive three names, one from the parents, and two from the maternal and paternal grandparents. In some places, the first name is the personal name, the second is their praise name that reflects the hopes for the child's life, and the third name ties in the family and community. With such high expectations put on a child through their name, the parents tend to use that against them when they misbehave. African Proverbs are used to help parents drive home the messages to their children. The name is used to steer the child through life in a positive direction that was carefully chosen before the child was even born. Abena - "Born on Thursday"
Abeni - We asked for her, and behold, we got her"
Abidemi - "Born during father's absence"
Abioye - "Born into Royalty"
Babirye - "First of twins"
Bosede - "Born on Sunday"
Chiamaka - "God is Beautiful"
Chidubem - "Guided by God"
Delu - "The only girl"
Dubaku - "Eleventh born child"
Gbemisola - "Cary me into wealth"
Idowu - "Born after twins"
Iniko - "Born during troubled times"
Kato - "Second of Twins"
Lumusi - "Born face down"
Melisizwe - "Leader of the nation"
Monifa - "I am lucky"
Nkiruka - "The best is still to come"
Nonye - "Stay with us"
Nosizewe - "Mother of the nation"
Ochieng - "Born when the sun shines"
Olufemi - "God loves me"
Oni - "Born in sacred bode"
Tafari - "He who inspires awe"
Wekesa - "Born during harvest"
I've always taken the meanings of names seriously but there are many parents who don't care about it and don't think that the meaning of the child's name will have any impact on their life. Here is an entire continent that says differently. Meanings are our identities, according to African parents. Which of the above meanings do you like best? Note: I am not African and have never been to Africa. If I have gotten any information wrong, please let me know so I can correct it. 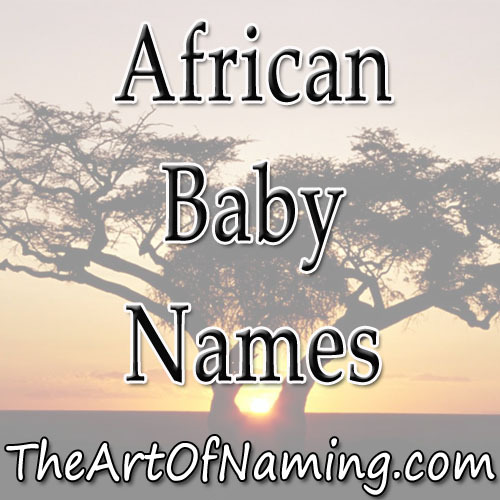 This week we will be focusing on African Names! I chose a handsome boy name that comes from Uganda. Kato is a great example of the way African names are used. It means "second of twins" which clearly describes the circumstances at the time of the birth. Perhaps his twin brother would be named Babirye or Isingoma which both mean "first of twins." I will be discussing African Naming traditions more thoroughly on Wednesday! 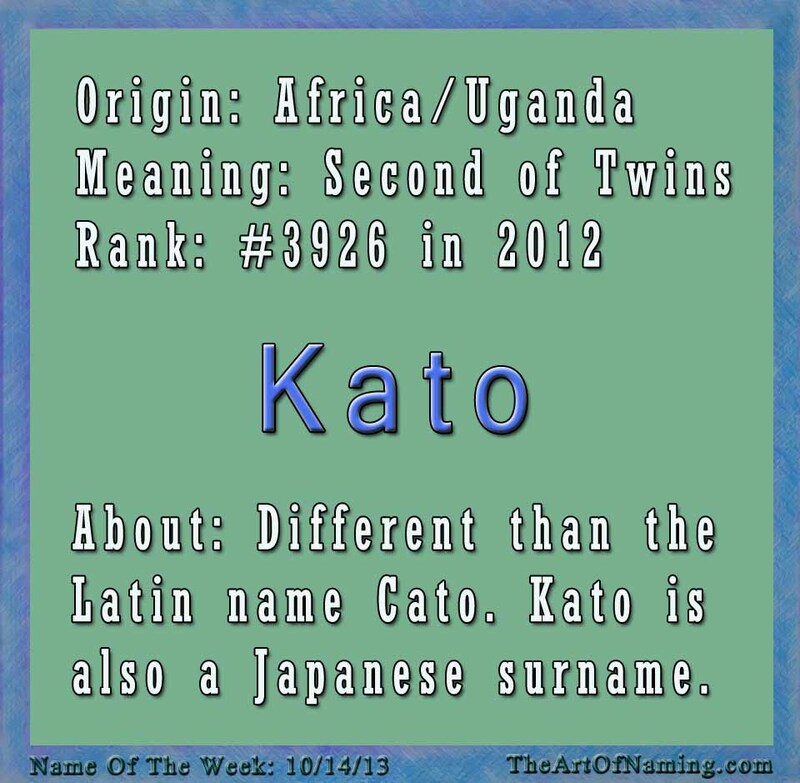 Kato is a much different name than the Ancient Roman Cato which is male and means "wise." There is also a feminine Cato which is a diminutive of the Dutch Catharina and an entirely different name than the first two! This name has occasionally been used in the US since 1914. It was only used for 6 babies between 1928 and 1972. Kato gained more regular usage in 1993 but it is nowhere near the Top 1000. Last year, there were 26 baby boys given the name which ranks it at #3926. I'd say that it is not unfamiliar but it is definitely rare! Somewhat-famous Katos that you may have heard of are most likely not claiming this African meaning and origin. In fact, a couple of the men named Kato use it as a nickname or an alias. It is not their real name, but rather, it is inspired by a fictional character. There is a Korean-American music producer who goes by Kato, but his real name is Christopher Ju. And perhaps you remember Kato Kaelin who was a [rather untrustworthy] witness in the OJ Simpson murder trial. His real name is Brian Jerard Kaelin. The only reason either of these two men have ever been called Kato is because they are big fans of the character named Kato who was played by Bruce Lee in the TV series "The Green Hornet." "Wait a minute!" you say. "The character in that show was Asian, not African!" Yes he was. Kato is also a very common Japanese surname that is comprised of characters meaning "to add/increase" and "wisteria". I think the majority of people who use Kato today are either inspired by the Green Hornet's sidekick, or they are using a "different spelling" for the aforementioned Cato. However, I am not featuring those names. 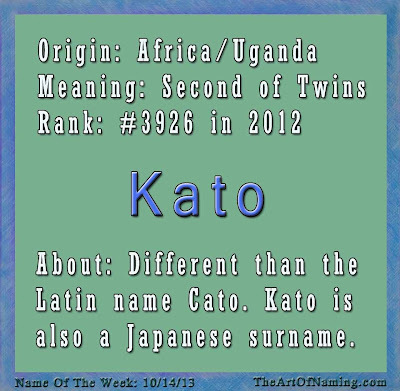 The Name of the Week is the African Kato. I chose it because it was the most familiar-sounding African name that I could find, and it probably only sounds familiar because of its usage in Japan and elsewhere. Wasn't there a Cato in the Hunger Games? Well anyway, what do you think of Kato? Do you know anyone with this name, and if so, what inspired it? Let me know in the comments below! Post the names that you came up with in the comment section for all to enjoy! You may even write what their ages are and come up with a last name for them if you wish. Thanks for playing! And remember that there are more baby-name-games like this one in the forum section on the blog! 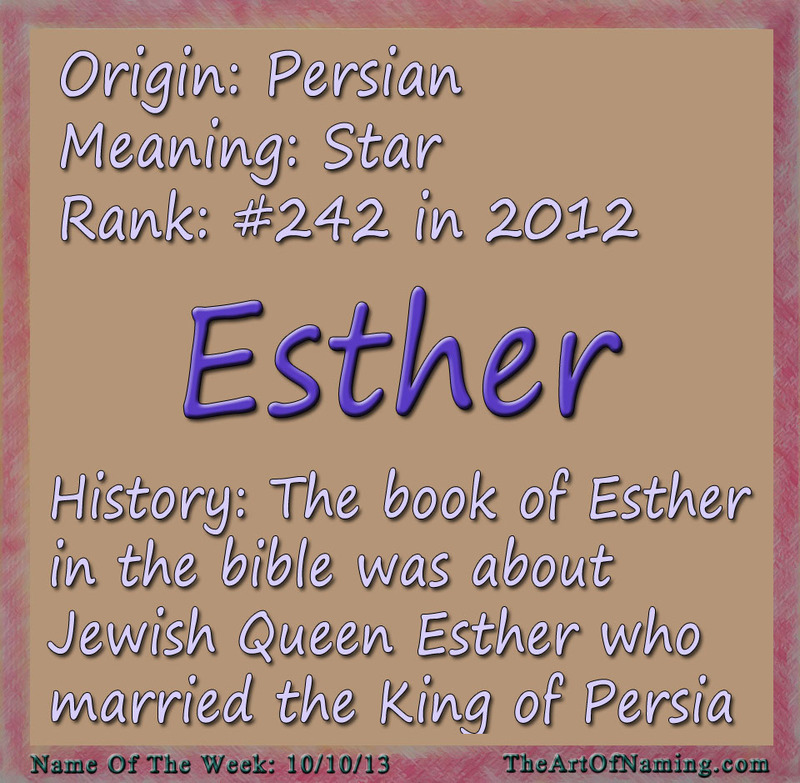 The Name of the Week is the biblical girl's name Esther. 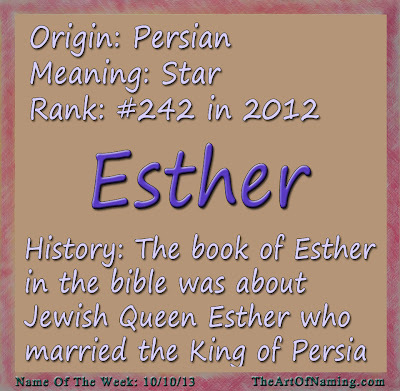 Esther is considered a Persian name that means "star" and is related to names like Estee and Hester. However, as an alternative, the origin could possibly come from the goddess name Ishtar. In the Old Testament, Queen Esther was the focus of the Book of Esther. She was the Jewish wife of the King of Persia who is known for saving the Jews from being killed. Esther's original Hebrew name was Haddassah. In American history, President Grover Cleveland named his daughter Esther in 1893 which gave the name a popularity boost. 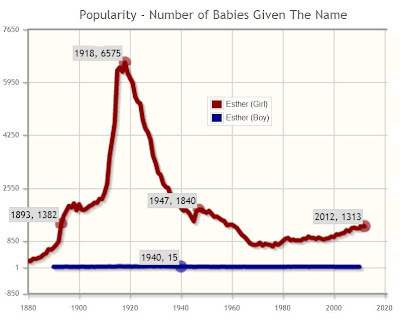 Esther jumped from 824 births in 1892 to 1,382 births in 1893. It continued to gain popularity over the next couple decades, peaking at 6,575 births in 1918 (#38). The name declined in usage after that, but has never dipped lower than #348. Esther has had a slight boost in usage since 2000. In 2012, there were 1,313 baby girls given the name, ranking it at #242. This is a lovely name with a vintage feel to it since it had such popularity in the 1920s. It could very well join the other names that fit the "100 year rule" and see a boost in usage in the coming years. It fits right in with Edith. I would pair something equally feminine and lovely with it. What would you pair with it? What do you think of the name overall? Let me know in the comments below! I've always felt that coming up with lovely biblical names for girls was a bit of a difficult task. After all, there are so many men in the bible and sometimes the women aren't named. It turns out there are many more name options than you might think. Here is a list of some of the more wearable choices for a modern girl. Be sure to do some research about the biblical person to make sure the name you're choosing is a good one! :) Which is your favorite? There are even more options than that! Here is a full list of names that come from the bible. Let's find out more about these names! Evelyn is an English surname that comes from the name Aveline. It was originally common for boys in the 17th century but because of similar feminine names like Evelina, this name is all-girl now. Eva is the Latinate form of Eve, meaning "life". It is also a variant of the Russian Yeva. This name works well internationally. It has ranked well in 17 countries, even hitting #1 in Slovenia in 2011. Evangeline is a Greek name that means "good news". There is an epic poem entitled "Evangeline" that was written in 1847 by Henry Wadsworth Longfellow. Eve comes from the Hebrew words "Chawah" which means "to breathe" and "Chayah" which means "to live". Eve was the first female human as written in the Book of Genesis in the bible. This name was used in the middle ages and gained more popularity in the 19th century. Everly has been used on boys because of its association with the Everly Brothers, but nowadays it is very female. It is English meaning "wild boar in the woodland clearing" which is more of a boyish meaning to me! Eveline is my favorite of the bunch. It is a variant of Evelina which comes from Aveline which is derived from Germanic elements possibly meaning "desired". It is very rarely used but has been around since the 1880s in the US. Evadne surprised me in how unused it is. I've seen it around and its one of my favorite Greek names, but it hasn't been used at all since 1992-1994, and before that 1962. I suppose she does have a tragic story in Greek legend. Which if these is your favorite? 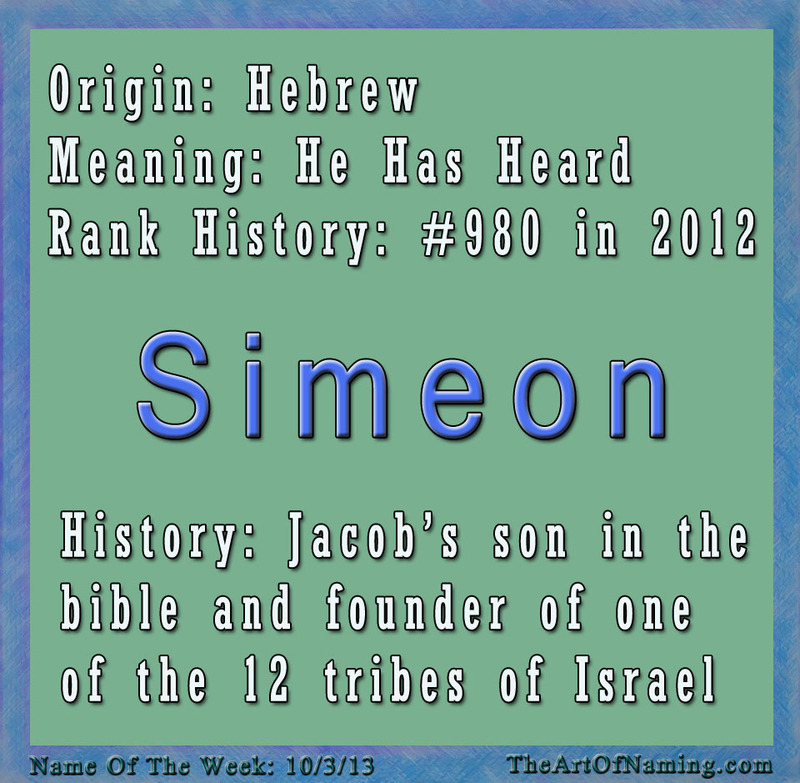 The Name of the Week is the biblical boy's name Simeon. Its cuter than Simon but follows the coolness of Gideon. It is pronounced SIM-ee-ən. It comes from the Hebrew name שִׁמְעוֹן Shim'on which means "he has heard" or "God is listening." 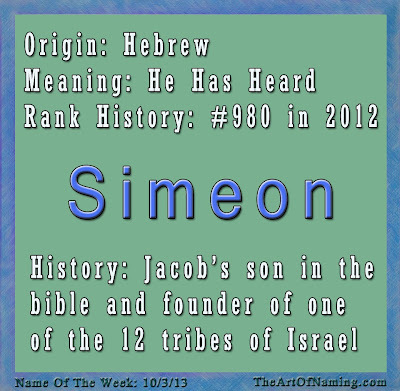 In the Old Testament, Simeon was the second some of Jacob and one of the ancestors of the 12 tribes of Israel. In the New Testament, Simeon was a man who blessed Jesus as a newborn. There was also a powerful ruler in Bulgaria who bore this name in the 10th-century. Simeon has also been a popular name for saints. In 2012, Simeon popped back onto the US Top 1000 chart at #980, with 202 male births. It has always been at the bottom of the chart, or just outside of it. It ranked as high as #360 back in 1880 (with 23 boys born). It ranked as low as #2034 in 1928, but has always has usage. Despite the number of births being higher today than ever, the name is still fairly rare but since it is biblical, its not unfamiliar. You wouldn't necessarily have to pair this name with another biblical choice. What would you pair with it? What do you think of the name overall? Let me know in the comments below! There are many names that have stood the test of time. Of those names, are names that come straight from the Holy Bible. Yes, Biblical names are still in fashion today and always have been. You cannot go wrong with these names, but I would recommend researching the people who first wore these names to make sure they were favorable. I personally would never consider using Cain because of who he was in the bible, but I'll leave those decisions to you! Here are some of the more popular biblical boy names. Which ones are your favorites? Of course, there are plenty more biblical names out there. Here is a much longer list! Don't forget to check out the list of Biblical Girl names too!